It’s imperative to criticize presumable progressive politicians and parse their words carefully. It might open the door to actual improvements in policy, writes Sam Husseini. In case you missed that, she did not say “the economy isn’t working well” or such, as we’ve all heard numerous politicos say countless times. It’s laudatory that Warren is using her perch and analytical skills to avoid a common rhetorical trap and is articulating the truism that the political establishment largely does the bidding of the wealthy and connected when it comes to the economy. The problem is that she doesn’t articulate that in the same manner when it comes to bloody wars. Quite the contrary. Her list of problems—drug companies, for-profit colleges and student loan outfits—omits those who have an interest in continuing horrific wars. Instead, Warren actually swallowed some of the rhetoric about U.S. wars having as their alleged goals stability or humanitarianism or security. The profits of military contractors or geopolitical elites went unexamined. But part of the fantasy is ignoring that the wars are indeed working great for some. Indeed, if Warren heard someone else say that “it is not working” about the economy, she’d likely correct them. Warren did at least raise the question of what “success” in the perpetual wars might be, which is certainly better than most of official Washington. Advocates of perpetual war “need to explain what they think winning in those wars look like and where the metrics are,” she said. What allies? France, Britain and Turkey—the traditional colonial power in the region? Or the ever-aggressive, oppressive Israel? Or the tyrannical Saudi Arabia? And that’s rather the point. U.S. foreign policy appears as a muddle—without any clear statement of what is supposed to be accomplished—because its stated goals obscure actual goals. The idea that the U.S. establishment gets the country into wars for ulterior financial or geopolitical reasons should be regarded as banal. Instead, it’s barely articulated at all. Most obviously, the military contractors benefit from wars. In 2015, Sen. Bernie Sanders was actually calling for more Saudi intervention in the Mideast. Said Sanders: The Saudis have “got to get their hands dirty.” He was criticized for this by Margaret Kimberley, David Swanson and myself. Now, Sanders has taken the lead in Congress in criticizing the Saudi war in Yemen, opening the door to some alleviation of massive suffering. I wish he would be much better still on foreign policy, but this may be serious progress, though the ACLU has criticized the congressional resolution. It’s imperative to criticize presumable progressive politicians and parse their words carefully. It might open the door to actual improvements in policy, as in the case of Sanders. And in the case of Elizabeth Warren, it’s simply asking her to cease obscuring war as she clarifies economic issues. Sam Husseini is an independent journalist, senior analyst at the Institute for Public Accuracy, and founder of VotePact.org, which encourages disenchanted Democrats and Republicans to pair up. Follow him on Twitter @samhusseini. Please visit our Facebook page, where you can join the conversation by commenting on our articles to help defeat Facebook censorship. While you are there, please like and follow us, and share this piece! In collaboration with Dennis Bernstein, host of Pacifica Radio’s syndicated show Flashpoints, Consortium News is today launching its second radio program, Consortium News on Flashpoints. Recorded and produced in the Berkeley, California studios of KPFA radio, Bernstein will interview three Consortium News writers about their recent articles published on this site. Each program will open with Consortium News Editor-in-Chief Joe Lauria discussing with Bernstein his picks of the three CN articles to be featured. The show will air twice a month on every other Friday. (We are about to launch a podcast of all our radio programming). On the first show, Bernstein interviews Sam Husseini on his piece The Limits of Elizabeth Warren; Patrick Lawrence about his article, ‘Too Big to Fail’: Russia-gate One Year After VIPS Showed a Leak, Not a Hack; and Joe Lauria, on his retrospective of Kofi Annan, who died last Saturday. Now the first episode of Consortium News on Flashpoints. Dennis J. Bernstein is a host of “Flashpoints” on the Pacifica radio network and the author of Special Ed: Voices from a Hidden Classroom. You can access the audio archives at www.flashpoints.net. You can get in touch with the author at dennisjbernstein@gmail.com . If you valued this original article please consider making a donation to Consortium News so we can bring you more stories like this one. Senator Elizabeth Warren was pushed to her limit at the National Press Club, entrapped by a system she says she wants to debate, but clearly can’t, as Sam Husseini explains. Senator Elizabeth Warren at the National Press Club in Washington on Tuesday launched into a blistering attack on unfettered corporate power in America but waffled when asked about military spending and Israel’s recent brutal reaction to Palestinian resistance. Warren outlined with great specificity a host of proposals for eliminating financial conflicts, closing revolving doors between business and government and reforming corporate structures. She pilloried former Congressman Billy Tauzin for having done the pharmaceutical lobby’s bidding by preventing a bill for expanded Medicare coverage to include a program to negotiate lower drug prices. “In December of 2003, the very same month the bill was signed into law, PhRMA — the drug companies’ biggest lobbying group — dangled the possibility that Billy could be their next CEO,” Warren said. But Warren’s laudable tenacity in ripping corporate lobbyists’ “pre-bribes” evaporated when faced with questions on the bloated U.S. military budget and ongoing Israeli assaults on Palestinian children. Alexandria Ocasio-Cortez, the Democratic progressive who shocked the party by upsetting incumbent Congressman Joe Rowley in a New York primary election in June, had been mentioned earlier in the press conference. So I asked Warren if she agreed with Ocasio-Cortez who has proposed “slashing the military budget to help pay for human and environmental needs.” I also asked Warren if she would consider introducing and sponsoring [a version of] Rep. Betty McCollum’s (D-MN) bill on Palestinians children’s rights in the Senate? I now sit on Armed Services and I have been in the middle of the sausage making factory on that one. And that has pushed me even more strongly in the direction of systemic reforms. I want to be able to have those debates. I want to be able to get them out in the open and talk about these poor issues that affect our government, affect our people. I want to be able to debate them on the floor of the senate. I want to be able to do amendments on them. Right now the whole of big money over our government stops much of that. It chokes off much of the debate we should have. So I am going to give you a system-wide answer because I think that’s what matters here. This is not about one particular proposal, this is all the way across. How is it that we get the voices of the people heard in government instead of over and over the voices of the wealthy and the well connected. The voices of those with higher armies of lobbyists. So for me that’s what this is about. It was a classic politician’s evasion of sticky questions. She tells us she’s on the inside, invoking the cliché of “sausage-making.” She says she wants to debate the system. But she says she can’t. Warren seems to be crying out, trapped as she is in the compromise of power. We’ve been here before with would-be champions of the people who run up against the “system.” I could not help but think of Bernie Sanders in his 2016 presidential run when he was remarkably vague on foreign policy. It reached almost comical proportions when, during a CBS debate right after the November 2015 bombings in Paris, instead of answering a foreign policy question he pivoted back to income inequality. No doubt Sanders was treated unfairly by the Democratic Party and media establishments. But he was greatly diminished by not having serious foreign policy answers. Sanders began addressing foreign policy towards the end of his campaign and has since. But his answers are still problematic. At best they are too little, too late. Warren and other “progressive” candidates seem poised to follow suit. What are Warren’s real goals? If she really wants to enact legislation to rein in corporations, why hasn’t she found a rogue Republican to work with? Questioned at the press conference by a New York Post reporter, Warren couldn’t name a single Republican she could pair with. If her intent is to become the leading contender for the Democratic nomination will she simply play the sheepdog role of keeping the public on the “reservation” on behalf of the party’s elite? The public would probably also be shocked to learn that funding perpetual war, unauthorized by either Congress or the U.N., is already against the law. 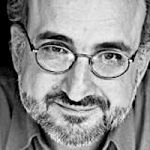 Sam Husseini is an independent journalist, senior analyst at the Institute for Public Accuracy and founder of VotePact.org. Follow him on twitter: @samhusseini. f you enjoyed this original article please consider making a donation to Consortium News so we can bring you more stories like this one. Who Will Weed Out the Warmongers? Exclusive: Progressive Democrats are gearing up to fight Wall Street appointees to a Hillary Clinton administration, but there is no similar campaign to weed out neocon/liberal-hawk warmongers, writes Robert Parry. If Hillary Clinton hangs on to win the presidency, liberal Democrats have vowed to block her appointment of Wall Street-friendly officials to key Cabinet and sub-Cabinet jobs. But there has been little organized resistance to her choosing hawkish foreign policy advisers. Indeed, Washington’s foreign policy establishment has purged almost anyone who isn’t part of the neoconservative/liberal-interventionist “group think.” That’s why pretty much everyone who “matters” agrees about the need to push around Russia, China, Syria, Iran, etc. The Post praised a new report from the liberal Center for American Progress which calls for bombing the Syrian military and getting tough to “counter Iran’s negative influence” in line with what all the neocons — as well as Israel and Saudi Arabia — want the next President to do. If they don’t, we can expect Official Washington to ratchet up tensions in a game of nuclear chicken with the expectation that the leaders in Moscow and Beijing will bow down to U.S. “exceptionalism’ and slink away with their tails between their legs. Surely, that is what the armchair warriors at The Washington Post will demand and they have, of course, a spotless record of infallibility, such as their certainty that Iraq was hiding stockpiles of WMD in 2003. Editorial-page editor Fred Hiatt was so sure of that he wrote it as flat fact. Given the Iraq War catastrophe and the failure to find the WMD, you might have assumed that Hiatt was summarily fired and has never worked in journalism again. But, of course, you’d be wrong. He is still the editorial-page editor of The Washington Post continuing to ladle out his extraordinary wisdom and brilliant insights. And, if you dare question those new certainties or note the risks of stumbling into a nuclear conflagration, the Post’s editorial pages label you a Moscow stooge repeating Russian propaganda. That is what Post columnist Anne Applebaum wrote about Republican presidential nominee Donald Trump when he warned about the risks of World War III if a President Hillary Clinton starts shooting down Russian planes over Syria. Rather than acknowledge the genuine risk of getting into a shooting war with Russia, neocon Applebaum declares such concerns unacceptable and offers a whiff of McCarthyism toward anyone who thinks such a thing. Then, with the typical perceptiveness of a neocon ideologue, Applebaum determines that the Kremlin is warning its citizens about the growing risks of nuclear war to scare them into line amid a recession that the U.S. helped create as part of its “regime change” strategy to destabilize Russia by making its economy scream. A thoughtful person might stop here and wonder if the use of economic sanctions and other means to destabilize nuclear-armed Russia is such a good idea, but no mainstream person is allowed to raise such questions inside Official Washington. That would just make you a Russian puppet, in Applebaum’s view. “Whatever the outcome on Nov. 8, political uncertainty will follow: the months of transition, a change of White House staff, perhaps even the violent backlash that Trump may incite. This could be an excellent moment for a major Russian offensive: a land grab in Ukraine, a foray into the Baltic states, a much bigger intervention in the Middle East — anything to ‘test’ the new president. Perhaps the more immediate question here is why a major American newspaper runs such crazy and reckless drivel from one of its regular columnists. But the fact that the Post does so indicates how dangerous the moment is for humanity. For those of us who read the Post regularly, such insane rhetoric barely registers since we see similar nuttiness on a daily basis. But the “group think” that the Post and other mainstream publications create and then enforce explains why there is such unity among the Establishment as it presses ahead with these dangerous policies in much the same manner that almost the same cast of insiders “group thought” their way into the disastrous Iraq War. So, the wannabe insiders at the Center for American Progress and the more established pooh-bahs at the Brookings Institution and other preeminent think tanks know they have to promote “regime change” strategies and other forms of warmongering to appease Hiatt and his fellow neocon editorialists and columnists. In Washington, this “group think” has moved beyond the usual careerist and conformist “conventional wisdom” into something more akin to totalitarianism, at least on foreign policy issues. That is why it is hard to even come up with a list of sensible people who could survive the onslaught of character assassinations if they were to be proposed as senior advisers to a President Hillary Clinton. That is also why the attention of progressives, such as Sens. Bernie Sanders and Elizabeth Warren, only on vetting domestic officials in a prospective Hillary Clinton administration is so insufficient. If a hawkish President Clinton surrounds herself with like-minded neocons and liberal hawks, the costs of their warmongering would surely swallow up the tax dollars necessary for domestic priorities – on infrastructure, education, health care, the environment and other pressing concerns. And, if the McCarthyistic intolerance of The Washington Post influences or infects her administration, the genuine risks of World War III will dwarf any other worries. At the Democratic National Convention, some tough-guy/gal militaristic talk has prompted floor shouts of “no more war,” while most domestic policy rhetoric has been markedly progressive, say Bill Moyers and Michael Winship. Shoot if you must these old grey heads, but these two semi-qualified observers of the passing political scene watched Monday night’s proceedings at the Democratic National Convention and saw past the heckles and opprobrium of the leather-lunged few. Instead, we witnessed an evening of progressive rhetoric and thoughtfulness unseen on a big political stage since the days of William Jennings Bryan, Wisconsin’s Fighting Bob La Follette, the Happy Warrior Al Smith and the crusaders of FDR’s New Deal. Not to mention Hubert Humphrey, Jesse Jackson, Shirley Chisholm, and a host of others who though history kept beating the drums for ordinary people against the organized might of Big Money. Progressive big hitters were out on the field Monday and they successfully swung for the fences. Michelle Obama, Elizabeth Warren and Bernie Sanders were batting like the Yankees’ legendary Murderers Row, aided and abetted by such powerful players as Representatives Keith Ellison and Raúl Grijalva, Philadelphia Mayor Jim Kenney and U.S. Senator Jeff Merkley. Michelle Obama was elegant and forceful as she looked back at her family’s years in the White House and endorsed Hillary Clinton. Elizabeth Warren did what only she can do, deconstructing the charade that is Donald Trump. And then the hour belonged to Bernie Sanders. As he endorsed Clinton, he was gracious in defeat: “I understand that many people here in this convention hall and around the country are disappointed about the final results of the nominating process. I think it’s fair to say that no one is more disappointed than I am. But to all of our supporters — here and around the country — I hope you take enormous pride in the historical accomplishments we have achieved. Then and there, the old socialist from Vermont liberated Democrats to be the champions of everyday people again. If only — and it’s a big if — if only the party can liberate itself from the stranglehold of Big Money. For off camera, out of sight and (for the moment) out of mind, one could sense the corrupting presence of the lobbyists of corporate America, the bag men of special interests, and the mercenaries there in Philadelphia with hefty infusions of campaign cash eager to bring the Democrats down from the ramparts of Les Mis and back to cold, cynical earth. Monday, we saw spirit and passion, ideas and aspirations, inspiring language, diversity (1,182 black delegates — as opposed to the GOP’s 18 — and 2,887 women), values, even the tears of Bernie’s supporters and yes, the willingness to join forces to defeat Trump. But those progressive voices ringing out so beautifully that night are the very ones fighting to free their party from the grip of millionaires and billionaires while at the same time the Clinton forces embrace the one-tenth of one percent represented by the multi-billionaire and former Republican Mayor of New York Mike Bloomberg. He spoke at the convention on Wednesday night, part of the Clinton effort to give moderate members of the GOP another reason to dump Trump. Nonetheless, the optics are less than great. We took time from the grace notes of unity and collaboration sounded at the convention to look over those Democratic National Committee emails dumped on the eve of the convention by WikiLeaks, communications that reveal just how low party fundraisers will stoop for cash, promising contributors access to the White House and other higher-ups in exchange for their donations. Avarice is bipartisan, as has been seen at both this year’s Republican and Democratic conventions. For the first time, both parties received no public money for their conventions so they were completely beholden to private funding. What’s more, Democrats reversed previous policy and lifted a ban on corporate and lobbying dollars to pay for their big soiree. “After those limits were lifted,” Matea Gold noted, soon-to-be-former DNC Chairwoman Debbie Wasserman Schultz “and other top party officials showered corporate lobbyists with calls, emails and personal meetings seeking convention support and PAC contributions to the party, according to a spreadsheet logging the contacts.” This year’s sponsors include Lockheed Martin, Home Depot, AT&T, Xerox, Twitter, Microsoft and Facebook. And then there’s this report by Megan R. Wilson at the Washington paper, The Hill: “Presumptive Democratic nominee Hillary Clinton has accepted more than $9 million in bundled donations from registered lobbyists, while the DNC has rolled back the lobbyist bans that Obama put into place. It’s an old story. Candidates seek the votes of citizens only to turn around and promise the only real access to donors. And once again representative government is disrupted because the winners so rarely govern as they campaigned. They can’t, because they are tethered to the demands, claims and tendered IOUs of the rich and privileged. That the system is so rigged has been a major theme of the Sanders campaign, and on Monday, it was reiterated by both Sanders and Warren as each called for the overturning of Citizens United and other court decisions that have flooded politics with money at a level beyond imagination. In her acceptance speech Thursday night, Hillary Clinton doubtless will say similar things and praise the progressive gospel of campaign finance reform, professing to shun the appeasement of Wall Street – the big banks, hedge fund managers, and private equity oligarchs. All well and good, but if her actions and her party’s continue to prove otherwise, the rousing rhetoric of this week – and the historic nomination of the first woman as a presidential nominee –may fade to insignificance as an angry, disillusioned, and despairing public opens the door wide for the phony “I’m so rich I can’t be bought off” gospel of Donald J. Trump. Caveat emptor. Hillary Clinton’s VP choice, Tim Kaine, is well liked Inside the Beltway, partly because he bends to pressure from Wall Street, DLC-style “centrists” and the austerity-pushing mainstream media, explains ex-bank regulator William K. Black. By picking Sen. Tim Kaine, Hillary Clinton has revealed her true preferences and shown that her move to the left on policy issues during the primaries was simply a tactical move to defeat Bernie Sanders. It’s not what you say, it’s what you do. Clinton can talk about caring about the U.S. public, but this choice cuts through the rhetoric. The two politicians to whom she gave serious consideration to choosing as her running mates were Kaine and Secretary of Agriculture Tom Vilsack. What both men share in common is, like the Clintons, being leaders of the Democratic Leadership Council (DLC). The DLC was, on economic and foreign policy issues, a servile creature of Wall Street – funded by Wall Street. As Tom Frank’s new book Listen, Liberal documents, the DLC vilified the New Deal, financial and safety regulation, organized labor, the working class, opponents of militarism, opponents of the disastrous trade deals that were actually backdoor assaults on effective health, safety and financial regulation, and the progressive base of the Democratic Party. Kaine, like Hillary Clinton, has embraced for decades the DLC/’New Democrats’ agenda – meaning they are allies of Wall Street. They embrace a neo-liberal, pro-corporate outlook that has done incredible damage to the vast majority of Americans. Kaine is actively pushing to weaken already grossly inadequate financial regulation and pushing to adopt the indefensible “Trans-Pacific Partnership” (TPP). By choosing Kaine, Hillary Clinton is signaling that her new-found support for financial regulation and opposition to TPP is a tactical ploy to win the nomination before she “pivots” back to the disastrous policies that she, Kaine and Vilsack have helped inflict on the world for decades. She is playing into Trump’s claims that she is not honest. What’s especially noteworthy is that Hillary Clinton and Kaine are carrying Wall Street’s water while the Republican Party is repudiating some of these policies. The Republican Party platform (cynically) calls for reinstating Glass-Steagall, and Donald Trump has called for the defeat of TPP in an equally cynical fashion. The self-described liberals – the Clintons, Kaine and New York Times columnist Paul Krugman – are against reinstating Glass-Steagall. This shows Hillary Clinton hasn’t learned a thing from the failed pro-Wall Street policies that have wrecked the economy. It’s bad politics and it’s bad policy. As an attorney, professor of economics, serial whistleblower, former financial regulator and white-collar criminologist, I can explain exactly how the DLC and their Republican allies, both of which were traditionally funded by and servants of Wall Street, rigged the system. You can be sure that people like me who have demonstrated their ability and willingness to destroy the rigged system in order to regulate and prosecute financial elites and their political cronies will never be appointed by a Clinton/Kaine administration. And that’s just on the finance. On the economics, the choice of Kaine signals that Hillary Clinton is openly returning to her life-long embrace of the economic malpractice of austerity. Recall that Bill Clinton tried, in league with Newt Gingrich, to largely privatize Social Security. That is Wall Street’s greatest dream. The only reason it didn’t happen is that the Republican rebels asked for too much and that scuttled the deal that Bill Clinton was making with the Republican-controlled Congress. The same thing happened when the Tea Party sank President Barack Obama’s efforts to reach a “Grand Bargain” with the Republicans to adopt austerity and make cuts to the safety net. The leadership of the now defunct DLC continues to applaud the cuts they made to Social Security and the oxymoron they called “welfare reform” that has brought so much misery to poor mothers. The preposterous lie that, working with President Ronald Reagan, they “saved Social Security” is repeated daily on the intro to an MSNBC program. Even though it would be good politics as well as policy for Hillary Clinton to break with the Wall Street wing of the Democratic Party and choose a VP from the Democratic-wing of the Party, she refuses to even pretend that she gave serious consideration to choosing a progressive as her running point. Democrats should take a lesson from economics and focus on this clear case of “revealed preferences.” She is telling us that she intends to ensure that should she be elected and unable to complete her term of office she can be confident that her successor will continue the DLC’s disastrous agenda. Exclusive: Democratic Party honchos who wanted Hillary Clinton’s coronation are having some regrets as her weaknesses become obvious, her poll numbers sink, and Donald Trump surges toward the lead, reports Robert Parry. Last year when Democratic insiders looked forward to Election 2016, they expected a run-of-the-mill Republican, possibly even legacy candidate Jeb Bush. So they countered with their own “safe” next-in-line legacy candidate, Hillary Clinton, who would supposedly win by playing up the prospect of the first woman president. In such an expected match-up, the concern of rank-and-file Democrats about Clinton’s hawkish foreign policy would be negated by the GOP nominee still defending President George W. Bush’s Iraq War and again surrounded by neocons pounding the drums for even more wars. With both parties putting forward war candidates, anti-war Democrats would accept Clinton as the lesser evil, or so the thinking went. The likely Republican nominee also would be burdened by reactionary domestic proposals, including GOP plans for privatizing Social Security and Medicare. By contrast, centrist Clinton would look reasonable in promising to protect those popular programs, albeit with some modest trimming of benefits to please the budget hawks. But the Democratic insiders didn’t count on the unlikely emergence of populist billionaire Donald Trump, who repudiated Bush’s Iraq War and the GOP’s neocon foreign policy and rejected Republican orthodoxy on “entitlement reform,” i.e., slashing Social Security and Medicare. At first, the Democratic hierarchy couldn’t believe its luck as the Republican Party seemed to splinter over Trump’s disdain for the GOP’s neocon interventionism and rejection of the party’s cutbacks in Social Security and Medicare. Trump’s mocking attacks on his rivals also shattered the decorum that Republican leaders had hoped would mark their primary campaign. So, the Democratic insiders initially rubbed their hands with glee and imagined not only an easy presidential victory but major gains in the House and Senate. However, new polls show Trump running neck-and-neck with Clinton nationally and in key battleground states, while other polls reveal strong public doubts about Clinton’s honesty, thus wiping the premature smiles off the Democrats’ faces. Indeed, some Democrats reportedly are slipping into panic mode as they watch Clinton’s poll numbers tank and the Republican Party come to grips with the Trump phenomenon. The new storyline of Campaign 2016 is the tale of top Republicans reconciling to Trump’s populist conquest of the party. At least, these GOP leaders acknowledge, Trump has excited both average Republicans and many independents. The obsessive media coverage of Trump’s meetings on Thursday with senior congressional Republicans made the narcissistic real estate mogul and reality TV star look like some major world leader being received in Washington as a conquering hero. And, with the GOP rallying behind Trump, the likelihood is that his poll numbers and favorable/unfavorable ratings will continue to improve. So, instead of Democratic dreams of a landslide victory, the party insiders are worrying now about their decision to coronate a deeply flawed and wounded candidate in Hillary Clinton. Not only could she lose to Trump but she could take many of the House and Senate candidates down with her. It’s dawning on some Democrats that they may have squandered a historic opportunity to realign American politics to the left by promoting the wrong person in 2016. At a moment when the American people are demanding change – even willing to risk entrusting the White House to the unorthodox and inexperienced Donald Trump – the Democratic Party may be stuck with an uninspiring status quo candidate who also is pro-war, indeed far more hawkish than President Barack Obama. This November could be the first time in modern American history when the Republican nominee would be the relative “peace candidate” and the Democrat would be the “war candidate.” That changing places could lose Clinton much of the “anti-war left,” a significant faction within the Democratic coalition with many “peace Democrats” either voting for Trump or choosing a third party, such as the Greens. Of course, the Democrats didn’t have to be in this position. The party leaders could have encouraged a more competitive primary contest instead of trying to keep alternative candidates, such as Sen. Elizabeth Warren and some younger Democratic prospects, on the sidelines, all the better to give Hillary Clinton an unimpeded path to the nomination. The party insiders treated Clinton like an incumbent president seeking reelection, a foregone conclusion. But the best laid plans of mice and politicians often go astray. How weak Clinton is as a candidate has been underscored by her struggle to put away a progressive challenge from Sen. Bernie Sanders, a 74-year-old “democratic socialist” from Vermont, who isn’t even technically a Democrat, listing himself as an Independent. Even though the vast majority of “super-delegates” – i.e., party insiders – have lined up behind Clinton and she leads in pledged delegates, Sanders continues to win primaries, including recent ones in Indiana and West Virginia, and he could roll up a series of victories in upcoming western state races. Clinton could stagger to the Democratic convention in July with a dispirited party lining up glumly to witness her long-delayed coronation. The onlookers might sense that they had made a terrible mistake but couldn’t correct it. They would be left to grit their teeth and hope that Clinton’s self-inflicted wounds, such as her private emails as Secretary of State, don’t fester and become fatal. Arguably, it is the Democrats who would benefit the most from a contested convention, one that might give them an opportunity to reconsider the choice of Clinton and either nominate Sanders, who fares much better against Trump in poll match-ups, or pick someone else, possibly a fresh face like Sen. Warren. While that may be highly unlikely – even if Sanders sweeps the remaining primaries – it is beginning to dawn on Democratic insiders that their scheme to grease the skids for a Clinton nomination might end up slipping Donald Trump into the White House. Exclusive: Support for the “war on drugs” has eroded so much that anti-drug-war hoax statements from senior officials sounded plausible even to the mainstream media, writes Jonathan Marshall. In 1998, assembled delegates to the United Nations vowed to largely eliminate the world drug problem within a decade. Eighteen years later, of course, the problem is bigger than ever. This April 19-21, the UN held its next global summit on drug control in New York City, with less laughable results. The acronym for the event — UNGASS — suggested that the proceedings might consist of the usual political hot air and flatulent speeches. But some news accounts of the event reported a remarkable change of heart among world leaders — away from the century-long policy of law enforcement and crop eradication in favor of radical alternatives like drug legalization. Alas, those decent and informed sentiments proved to be a hoax. Kevin Campo doesn’t exist, and Fedotov never said the words ascribed to him in a fake press release, probably engineered by supporters of marijuana legalization. As the spoof itself illustrated, however, this U.N. conclave actually did achieve something: unlike the dismal 1998 summit, it provided a venue for voices of sanity to question the “war on drugs” that has consumed countless lives and untold billions of dollars in a fruitless effort to repeal the law of supply and demand. Colombian President Juan Manuel Santos, representing one of the world’s leading “source” countries for illicit drugs, used the forum to condemn the “repression” of small growers — a policy demanded by Washington and backed up over the years by arms, herbicides, police and military training, and threats to cut off aid for non-compliance. Santos has taken Colombia in a sharply different direction than that of his conservative predecessor Alvaro Uribe, who was long favored by Washington despite (or because of) his support for right-wing, drug-trafficking paramilitary groups. Santos is working to conclude peace talks with two Marxist guerrilla groups that have engaged in drug trafficking to finance their rebellions. His success would not only bring Colombia welcome relief from decades of violence, but would likely also create better conditions for encouraging peasants to substitute commercial crops for coca, cannabis, or poppies. Other leaders in the Americas have also broken with the status quo. Uruguay legalized the possession and sale of marijuana; Mexico says it intends to ease restrictions on personal use of pot, and so does the new government of Canada. In 2012, the then-president of Guatemala called for international legalization of drugs. Advocates of ending the war on drugs point to documented harm reduction from drug decriminalization programs in Portugal, Switzerland and Holland. Evidence also suggests that the growing movement to decriminalize marijuana use in some U.S. states has cut sharply into the sales of Mexican drug cartels. The Obama administration has tread with extreme caution to deflect partisan charges of being “soft” on drugs. Secretary of State John Kerry issued a statement calling for “a pragmatic approach that better balances public health and law enforcement” while still attacking international trafficking organizations. President Obama has previously offered reformist words, but through his appointments and budget priorities has continued to support traditional “drug war” policies that fill prisons with non-violent criminals, militarize police forces, and devastate communities of color. The wisdom of those failed policies is more open to question than ever thanks to the recently ended U.N. summit. 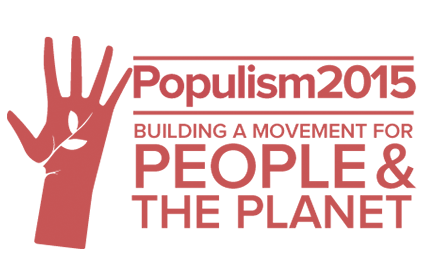 American government increasingly bent to the whims and desires of the wealthy is emerging as a populist issue among pro-democracy citizens who favor the old idea of government for the people, as Michael Winship describes. To the blare of sounding brass and booming drums, some 800 activists and community organizers from around the country recently converged on Washington, DC. We are living, breathing proof, they announced, that if we can’t get change from our representatives in the capital, we’ll bring it to them, and work to make them hear what must be done. For anyone dispirited by the malaise of powerlessness or disgusted by the dysfunction of mainstream politics, the gathering was a hopeful sign that in every part of the United States, people are taking matters into their own hands and demanding attention and respect. And so, Janice “Jay” Johnson, treasurer of Virginia Organizing/Alliance for a Just Society, described their fight against predatory payday lending. Jean Ross, co-president of National Nurses United, spoke of the perils of austerity “Come into any emergency room; these policies kill people”, and called for passage of HR 1464, the Inclusive Prosperity Act. That’s the Robin Hood Tax that would collect 50 cents on every hundred dollars of stock trades. “Take that money back from the banksters,” she declared. Vien Truong of California’s Greenlighting Institute told the story of their involvement in the successful effort to get $832 million in cap-and-trade agreements from polluters, money the state will spend on such programs as free bus passes for seniors and students, electric trucks and buses and affordable green housing. Eric Kennedy of the Washington Community Action Network outlined the campaign for a living wage in the Pacific Northwest and Bob Cook of PUSH Buffalo talked about their work for a green economy and the group’s involvement in the successful New York State ban on fracking. George Goehl, executive director of National People’s Action, said, “America’s beauty has always come from how we react to injustice,” and stressed the need to rebalance the relationship between everyday people and corporate America, as well as the importance of seeking candidates with ideas and plans to address structural racism in America. He introduced Congressman Keith Ellison of Minnesota, co-chair of the Congressional Progressive Caucus. Rep. Ellison talked about those “systematically trying to exclude people from the vote,” but also detected “a renaissance of democracy and civic engagement,” and urged the crowd not to give up on Capitol Hill: “Not everyone in Congress has sold out,” he said. “Eighty people in Congress are down with you”, presumably, the members of the progressive caucus plus a few friends. “Thirty-five are down with you on each and every issue.” It’s a start. Introduced were three activists who have themselves sought public office: Gina Melaragno of Maine People’s Alliance became a state representative when she grew fed up with the incumbent’s indifference to the needs of his constituents; Carlos Ramirez-Rosa is a gay Latino just elected as an alderman in Chicago’s 35th Ward, part of the progressive coalition that sought to unseat Mayor Rahm Emanuel and forced him into a runoff with Jesus “Chuy” Garcia; and Jim Keady of the New Jersey Organizing Project is running for the state assembly. He’s the guy Gov. Chris Christie told to “sit down and shut up” last fall when Keady had the temerity to challenge Christie’s mishandling of aid to the victims of Hurricane Sandy. As Congressman Ellison pointed out, “Politicians see the light when they start to feel the heat.” He was talking about public pressure to prevent passage of fast track legislation to grease the way for approval of the Trans-Pacific Partnership (TPP) trade agreement. 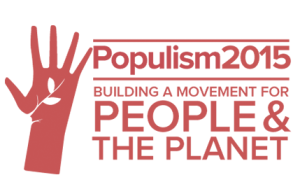 And in fact, the Populism2015 conference ended with a protest rally and march against TPP led by Sen. Bernie Sanders from the Washington headquarters of the AFL-CIO to the offices of the Chamber of Commerce and the U.S. Trade representative. The entire platform is online. Among its headlines: Rebuild America for the 21st Century and Create Jobs for All, Guarantee Women’s Economic Equality, Provide a High-Quality Education to Every Child, and Change Priorities to Address Real Security Needs. Israeli destruction of Gaza’s civilian infrastructure, including schools and hospitals, is getting a pass from Official Washington because Israel asserts Hamas fired rockets from near the sites, but a close examination of those claims reveals a different reality, writes Gareth Porter for Inter Press Service. That defense has already found its way into domestic U.S. politics. A possible contender for the Democratic nomination for president, Sen. Elizabeth Warren, defended her vote for more military aid for Israel during the Israeli assault on Gaza by citing the rocket launch defense. But although some Hamas rockets were launched near homes or other civilian structures, military developments on both sides have rendered that defense of Israeli attacks on civilian targets invalid. The rocket launchers for Hamas’s homemade Qassam missiles consist of simple tripods that can be removed in seconds, and the extensive Hamas tunnel network has given it underground launching sites as well as storage facilities for its larger, longer-range Grad and M-75 missiles. On the other side, the Israeli Air Force possesses air-to-ground missiles that are so accurate that they can destroy a very small target without any damage to civilian structure even if it is very close. A video released by the Israel Defense Forces (IDF) in a report on Hamas’s “illegal use of civilian infrastructure” last month shows an attack obviously by an Israeli drone, on an underground rocket launcher only a few meters away from a mosque causing no damage whatever to the mosque. These technological changes take away any justification for flattening civilian buildings even if a rocket launch site is nearby. In fact, however, the evidence now available indicates that Hamas launch sites are not that close to hospitals, schools and mosques. The IDF sought in mid-July to use the rocket launcher defense to explain the damage to Al Wafa Rehabilitation and Geriatic Hospital in eastern Gaza City from 15 rockets, which forced the staff to evacuate its patients. An IDF spokesman said the military had “no choice” because rockets had been launched from very near the hospital. Clearly revealing that the rocket launch justification for the attack was a ruse, however, the spokesman revealed to Allison Degler of Mondoweiss that the alleged launch site was 100 meters from the hospital. That would have been far more space than was needed to strike the launch site without any damage to the hospital whatever. When the IDF destroyed Al Wafa hospital completely by airstrikes on July 23, it abandoned the pretense that the reason was a Hamas rocket launch site. Instead it released a video purporting to show firing at IDF troops from the hospital. It turned out, however, the video clips of the firing been shot during “Operation Cast Lead” in 2009, not in 2014. The IDF has continued to suggest that its destruction of public civilian facilities was forced on it by rocket launches from within those facilities. At the end of the “Operation Protective Edge” the IDF spokesman’s office claimed that 597 rockets had been launched from civilian facilities, of which 160 were allegedly fired from schools, 50 from hospitals, and 160 from mosques. But those figures were produced only by pretending that launching sites some distance from the facilities in question were on the premises of the facilities. An IDF “declassified report” released Aug. 19, aimed at showing that civilian facilities were serving as military infrastructure for Hamas, includes no evidence of any rocket launches on the grounds of any civilian facility. A very blurry 20-second video appears to show a rocket launch from what is identified as “Abu Nur” school. But it, too, is deceptive. A black streak rises from the area of the school for a little more than a second of the video, but for the entire length of the video two voices declare repeatedly that they saw three rockets launched “from within the school”. Careful viewing of the footage reveals, however, that the apparent launch comes from outside the wall of the three-story school building rather than from within it. In three other cases of alleged rocket launches from schools, the IDF provides no visual evidence only large red dots drawn on an aerial view of the schools. During the “Operation Protective Edge,” the IDF openly targeted mosques, claiming they are military targets, demolishing 73 mosques and partially destroying 205 more. The Aug. 19 IDF report refers to a “rocket cache and gathering point for militants hidden in a mosque” in Nuseirat. But despite frequent repetitions of the notion that Hamas routinely stores rockets in mosques, the IDF has not produced photographic evidence of rocket storage in a single mosque. Nor has the IDF made public any video evidence of secondary explosions from the destruction of mosques. In a tacit admission that such evidence is lacking, the report instead cites an instance of a “concealed entrance” to a Hamas tunnel located between a mosque and a school. The most extensive destruction of civilian structures in “Operation Protective Edge” was the complete leveling of large parts of entire neighborhoods in the Shujaiya district of Gaza City on July 19. After the United Nations published a map showing the complete destruction of those areas of Shujaiya, the IDF published its own map on Aug. 4 aimed at justifying the destruction. The map shows that the IDF can’t claim the proximity of Hamas rocket launching sites as the justification for the leveling of many residential blocks in Shujaiya. The Israeli military had identified every home in the devastated neighborhoods on its map as a “hideout” for Hamas or Islamic Jihad fighters. The IDF obviously did not have actual intelligence on each of those homes that had been reduced to rubble. The massive designation of houses as “hideouts” indicates the Israelis believed Palestinian fighters were hiding in some of them. Although the red dots on the IDF map identifying rocket launch sites are too big to estimate accurately the distance between them and the closest houses, only a few such dots appear to be as close as one city block to a house in one of the areas of massive destruction. And all but a few of the homes destroyed are much farther than a block from the alleged launching sites. An account of the Shujaiya destruction by journalist Mark Perry based on a July 21 U.S. Defense Department report recalls that the IDF fired 7,000 artillery shells at residential areas in the district the night of July 19, including 4,500 shells in the space of just seven minutes. Such massive and indiscriminate destruction of civilian structures is strictly prohibited by the international laws of war. Israeli officials have frequently said the purpose of IDF military operations in both Lebanon and Gaza was to “deter” their adversaries in the future by imposing heavy costs on the civilian population.